Asymmetric Peace, 33 x 27 inches, 2016. Old fashioned cross-stitch embroidery includes color-coordinated web links. I got involved in the whole drones process because I was representing people in Guantanamo Bay. And when President Obama came into office he says we’re going to close Guantanamo Bay and fairly quickly it dawned on me that yeah he didn’t like Guantanamo, so they were just going out and killing the people instead of locking them up. And when I met Shahzad [he] showed me the pictures of the dead children, then you think wow we better do something about this.—Human Rights lawyer Clive Stafford Smith, Reprieve. Taken from the documentary film ‘Drone’. One cloudy evening in April this year, a local cinema in Salina, Kansas screened the film ‘Eye in the Sky,’ a tale of the moral dilemmas facing those involved in drone warfare. The film was followed by an audience discussion. Many there expressed a feeling of having been at the edge of their seats while watching the gripping drama unfold. Others, however, felt the movie presented just another distracting, hand-holding scenario in which a big, moral/ethical question was sensationally shrink-wrapped to fit our entertainment-hungry imagination. In this case, the scenario involved the covert assassination program that is being carried out by this country in places like Pakistan, Somalia, Yemen, Afghanistan, Iraq, Libya. The movie was a one-hour, forty-three-minute advertisement for the U.S. military-industrial complex, with a spoonful of ethical dilemma slipped in as a digestive. Hollywood—the most dangerous illusionist of all—had once again jumped into the laps of our government and Intelligence agencies, fictionalizing and attractively packaging real issues that have real consequences for real people. In this thriller, the dilemma was framed as a choice between the almost certain drone killing of one sweet Kenyan girl selling bread and the (wholly theoretical) deaths of eighty other innocents later that day at the hands of terrorists. We were considering these points in our film discussion that April evening, when things turned quickly from tragedy to comedy. An audience member was interrupted mid-question by the shriek of tornado sirens and mobile-phone alarms. (This is the “Land of Oz,” remember?) Since there was no basement in the building, the host of the venue directed all of us into our gender-specific bathrooms to take cover. And that’s when everything fell into geographical perspective for me. Thanks to our carbon footprint and military might, one can see in both types of disasters we dealt with that evening—tornados and drones—the human hand. Here in Kansas, we can take cover from our sky-borne disasters; folks in Pakistan, Somalia and Yemen are not so lucky. That evening, we didn’t have to run from Hellfire missiles launched from Predator drones, piloted via satellite from some far-off country we’re not officially at war with. No, that’s what we do to other people, and if you’re a target—whether your business is terrorism or taxi-driving or bread-selling—you’re pretty much screwed. Here in Kansas, we have the luxury of joking, not only about death from the heavens but about segregation of the sexes as well. In the men’s room, as the sirens wailed that evening, my husband Stan was telling his buddies, “Hey, no offense, I love you guys but if this is the end, I’d a lot rather be with Priti than with you fellas.” In the ladies room, of course, I was thinking the same. So while we indiscriminately kill people in places like Waziristan, we discriminate against people in our own “land of the free.” If I were a transgender student in a similar situation in a school or university in Kansas, I’d be pretty much screwed too, like the kid playing cricket in Waziristan as unseen eyes hover in the blue sky above. 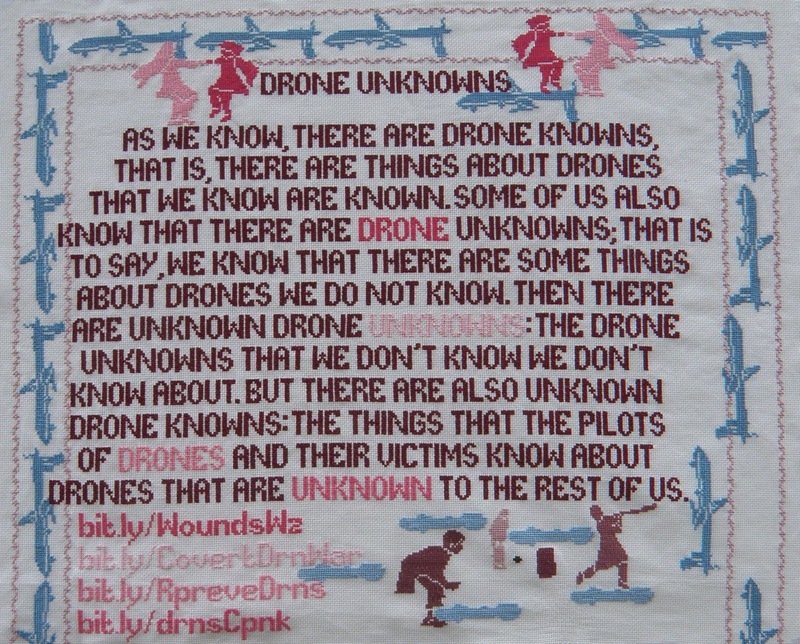 At the end of March this year, the University of Nevada Las Vegas School of Law held a symposium ‘Inside Drone Warfare,’ that included former drone operators’ accounts of working in the program, stressing the need for transparency and accountability. Among other details, they emphasized the affects of military force on children. You don’t need Nostradamus to tell you that under these circumstances, the more innocent civilians we kill, the more civilians we inspire to avenge those deaths. By our own example we should know that. As we approach the 15th anniversary of 9/11, look at how many innocents this country has killed, ostensibly to avenge that day. Obama or even Hillary Clinton, drone victims will still be incinerated with impunity. You have a connection between Google, the Clinton campaign and the Pentagon. And this triangle is extremely worrying. Google [has] bought more than 10 drone companies. It’s integrating its mapping data in order to better be able to fly and navigate drones around the world. They believe they can create a massive artificial intelligence, more powerful than any human being or any society’s ability to think. And, of course, we all know what happens when such power is in limited hands. You can just completely forget about any kind of antitrust legislation being used on Google if there is a Hillary Clinton White House. We’ve all had a good laugh at former Secretary of Defense and Poetry Donald Rumsfeld’s “Unknown Unknowns” soliloquy. Here’s an eloquent comment by (then) 13-yr-old Zubairur Rehman, a drone survivor from Waziristan, that will make you weep. I no longer love blue skies. In fact, I now prefer grey skies. The drones do not fly when the skies are grey, and for a short period of time the mental tension and fear eases. But as soon as the sky turns blue, the drones return and so does the fear. I wish that [Americans] could understand how afraid the children in my community are of drones. We used to play outside — cricket, football, volleyball, kabaddi. But now we sit in our houses, fear-struck. According to the 2013 WIN/Gallup International’s annual global End of Year survey that was conducted across 68 countries, the U.S.was considered to be the greatest threat to world peace. There was a description by a former high Jordanian official who’s now director of Middle East research for the Carnegie Endowment, Marwan Muasher. He said, “This is the principle.There is nothing wrong. Everything is under control.” Meaning, as long as the population is quiet, acquiescent — maybe fuming with rage, but doing nothing about it — everything’s fine, there’s nothing wrong, it’s all under control.— Noam Chomsky,February 2, 2011. What is unknown of the drones is the psychological torture of children who face death unknowingly and in an uncertain time and space. Also, the unknown fact is the sadist satisfaction of the president’s psyche in conducting drone warfare by remote controlling from air- conditioned rooms. ..?! !